In these tales from issues #1-6 of the hot new series, Slade Wilson's entire life is turned upside down after he learns that his involvement in a top-secret mission was wiped from his memory. 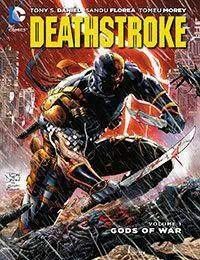 Now, a new, mysterious enemy known as Odysseus has targeted Deathstroke and everyone involved in the decade-old mission. But Slade's journey into his past takes an unexpected turn, leading him to Gotham City – and into conflict with both Batman and Harley Quinn!